I recently participated in a Low Volume fabric swap through the Late Night Quilter’s group on Facebook. If you are not a member of the Late Night Quilter’s Facebook Group, you are really missing out on one of the friendliest, most civil, and engaging quilting / sewing groups around! 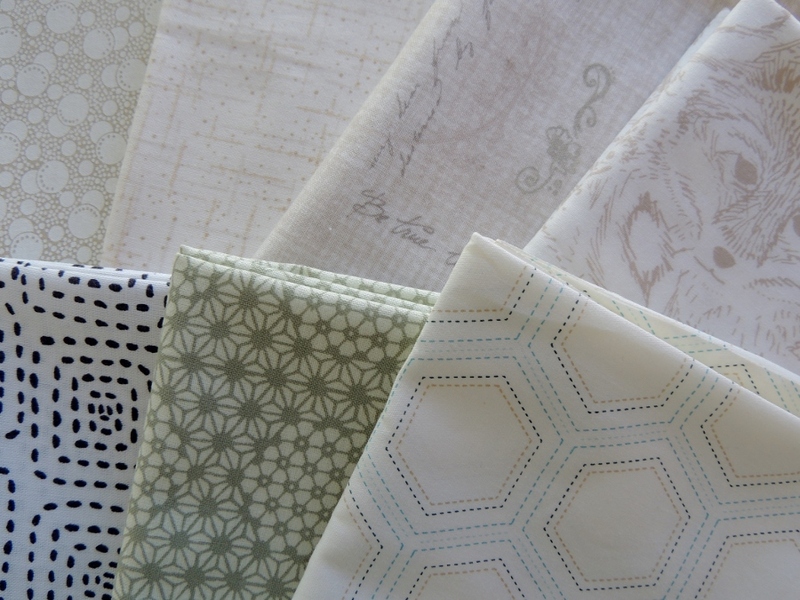 The swap was for fat quarters, and I am really delighted with the fabrics that I received. What is that cute little guy peeking from the edge of the pic? Looks like you have some great fabric! you did get some good ones ! LV’s are great – the more the merrier ! Great LV selections! You can never have too many like these quiet prints, since they make such good backgrounds and they blend with everything. I love a quilt with a scrappy LV background, the more the better! Ah these are brilliant, have you got any plans for them? Mmm nice, especially the second row! Oooh those are nice! I’ve slowly been growing my LV stash, but don’t really use them unless it’s for someone else. Very nice! LV prints are always so useful, it is nice that the swap was for fat quarters so there is enough fabric to really make things with. Yay! Great selection of low volumes, and I’m glad you enjoyed the swap! So many lovelies in that pile! I am very tempted by this Late Night Quilters business… but I fear too many commitments! Some lovely fabrics there, LVs aren’t something I’ve used too much, but I’ve been collecting a few recently for the background of my planned yoyo quilt. And, although I am itching to start it, I am also slightly nervous of it because it is quite different to other things I’ve made, so basically if you’re looking for any subject matter for future blog posts and you decided to do a post on the use of LVs in quilts I would read with extra, extra interest! I need more low volume in my life as much as I love them, I just don’t seem to be so drawn to them as color! aah! Those are great pulls and I’d be super happy with those!